Grape Seed Extract belongs to a health-promoting group of plant flavonoids known as proanthocyanidins (PCO's). These compounds are also known as oligomeric proanthocyanidins (OPC's). PCO's exist in many plants as well as red wine. How does Grape Seed Extract compare to Pine Bark Extract as a source of PCO's? PCO is drawn from extracts of grape seeds as well as maritime pine tree bark. In Europe, grape seed extract is the most popular source of PCO's, while in the United States, pine bark extract is most popular. This may be the case because many Americans do not know that grape seed extract contains 92-95% PCO's, while pine bark extract contains 80-85%. Aggressive advertising and misinformation has promoted pine bark extract to higher sales, while grape seed extract actually offers the higher content of PCO’s. As proof of the difference in the way these products are regarded in Europe, PCO's from both grape seeds and pine bark have been marketed in France for decades, but grape seed extract sales in that country are roughly 400 times greater than pine bark extract’s. There are other reasons that grape seed extract has emerged as the preferred source for PCO’s. First, the overwhelming majority of recently published clinical and experimental studies have been performed on grape seed extract sourced PCO's, not on pine bark extract. Second, extracting PCO's from grape seeds is far more economical than from pine bark, and as a result, grape seed extract provides greater value at a lower price. What is special about EHP Products’ Grape Seed Extract? EHP Products’ Grape Seed Extract product is Activin®, regarded by many as the most dependable brand of grape seed extract in the industry. Activin® is the premium quality all-natural extract of Vitis Vinifera grape seeds, which provides a rich source of biologically active flavonoids including oligomeric proanthocyanidins. 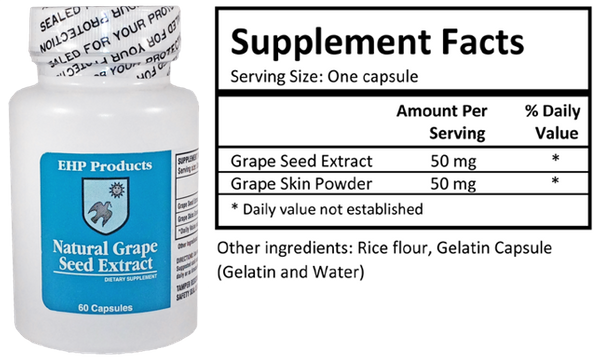 Each capsule contains 50 mg of grape seed extract and 50 mg of ground grape skins.